One of the great things about Microsoft OneNote is the ease with which teachers can provide feedback to students on their work, helping them to develop their ideas towards the submission of assessment. This was explained in detail by Ms Helaina Coote, our Head of Department for English, in this earlier blog post. 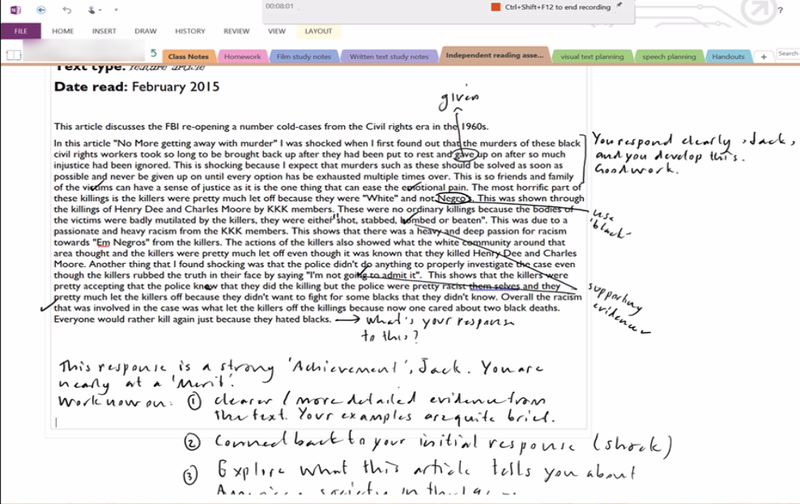 However, as the internal assessment season ramps up in 2015 a number of teachers have approached Tom Adams and I about how to “lock” OneNote notebooks to prevent students modifying content after the submission date. Whilst there are some work arounds, such as password protecting sections or moving them to a “read only” section in a teacher’s OneNote notebook, these are not always easy or intuitive as I explained in this post comparing the strengths and weaknesses of Moodle and OneNote. The teacher creates an “Assignment” task in Moodle setting the due date to be when all students need to have the assessment completed and handed in by. The option to allow “late” submissions exists within Moodle too, clearly showing to the teacher in red how many hours/days overdue the submission was. This could be useful in scenarios where students were away for legitimate reasons. The student exports either their page, section or entire OneNote Notebook into a PDF file on their local computer. The student goes to their Moodle course, clicks on the assignment and then drag ‘n’ drops the PDF file for upload and submission. The teacher can optionally include to have all students “sign” the authenticity agreement by clicking the “accept” each time they submit an assessment. Once the due date is reached, the teacher can bulk download all of the submissions for offline marking, moderation storage purposes or printing and returning. All assignments are stored in one place with a single click to download all assignments into a folder for marking / moderation. This also reduces the need for the Teacher to “harvest” the submissions from a variety of sources that students may have submitted by e.g. email, printed and left at the teacher’s desk or office etc. Students can be required to “sign” the authenticity statement for every assessment they submit within Moodle. Moodle supports the use of http://turnitin.com/ – an online tool for verifying the authenticity and originality of a submission. Whilst this costs, it would allow students to improve their work before a final submission and also support teachers in ensuring the submission is the original work of the student. On the St Andrew’s College website we share a number of reasons why we use technology in our classrooms, with one of them being preparing students for tertiary study and the workforce. The vast majority of tertiary institutes now require students to submit assessment online – by teaching our students to manage their time and to become accustomed to this form of assessment submission, they are being prepared for life beyond St Andrew’s. At this stage, there is no formal requirement for students to only submit their assessment via Moodle in this way. However, with the obvious benefits outlined above, along with the potential to include Turn It In to further assist in the originality and authenticity of student work, it is an idea that we presented to the combined Heads of Department meeting this week. There will be further discussion over the coming weeks and it may be something that we trial later this year.